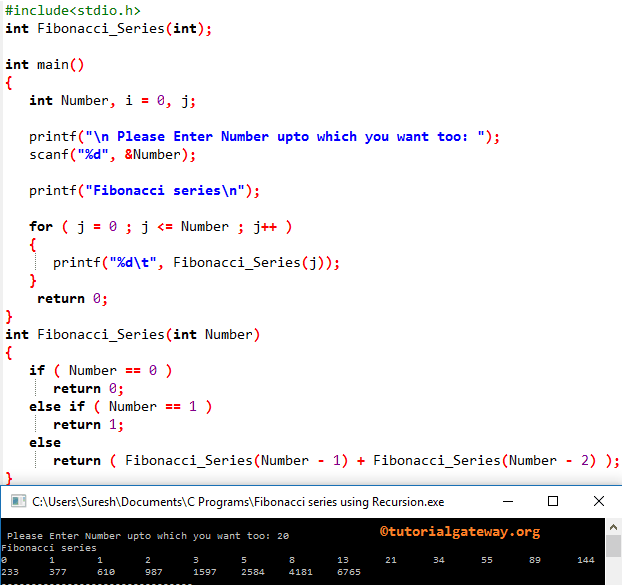 In this article we will show you, How to Write a Program to Print Fibonacci Series in C programming language using While Loop, For Loop, Functions and Recursion. If you observe the above pattern, First Value is 0, Second Value is 1, and the subsequent number is the result of sum of the previous two numbers. For example, Third value is (0 + 1), Fourth value is (1 + 1) so on and so forth. First, We declared 4 integer variables Number, i, First_Value, Second_Value, and assigned values as we shown above. Following statements will ask the user to enter any positive integer and then, that number is assigned to Number variable. Below While loop will make sure that, the loop will start from 0 and it is less than the user specified number. Within the While loop, we used If Else statement. If i value is less than or equal to 1, i value will be assigned to Next. If i value is greater than 1, perform calculations inside the Else block. Lastly, i will be incremented to 1. 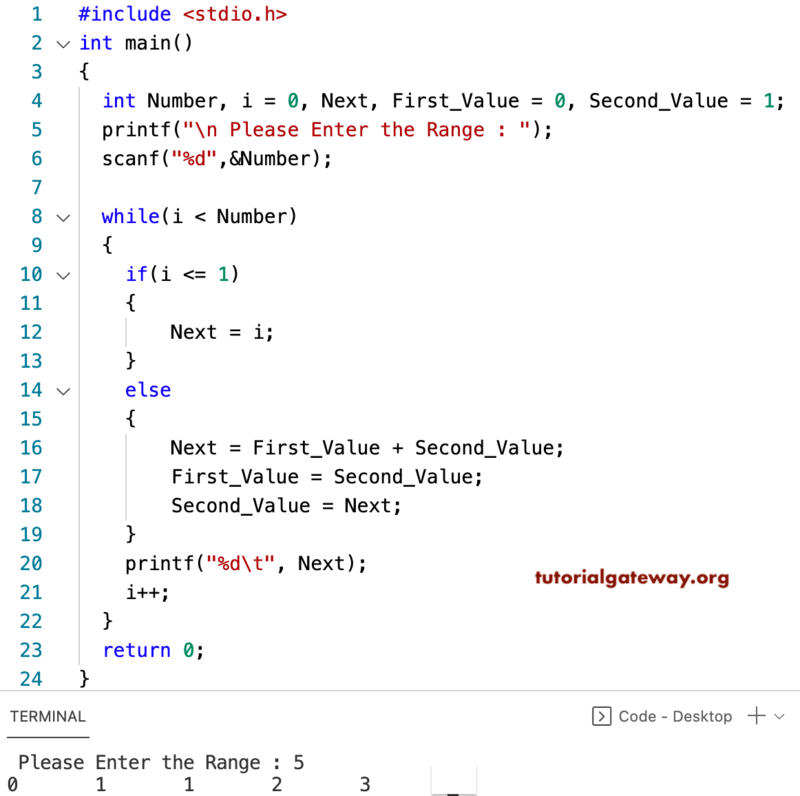 Please refer Increment and Decrement Operators in C article to understand the ++ notation. The condition inside the While (2 < 5) returns TRUE so, program will start executing the statements inside the while loop. Next, Print statement printf(“%d”, Next) will print the value 1. The condition inside the While (3 < 5) returns TRUE so, program will execute the statements inside the while loop. The condition inside the While (4 < 5) returns TRUE so, compiler will start executing the statements inside the loop. Next, Print statement printf(“%d”, Next) will print the value 3. While (5 < 5) returns FALSE so, program will exit from the while loop. We just replaced the While loop in the above example with the For loop. Please refer For Loop article here For Loop to understand the for loop functionality. We already explained LOGIC above example. NOTE: If we create a function with Void then there is no need to return any value but, if we declared a function with any data type (int, float etc) then we have return something out from the function. 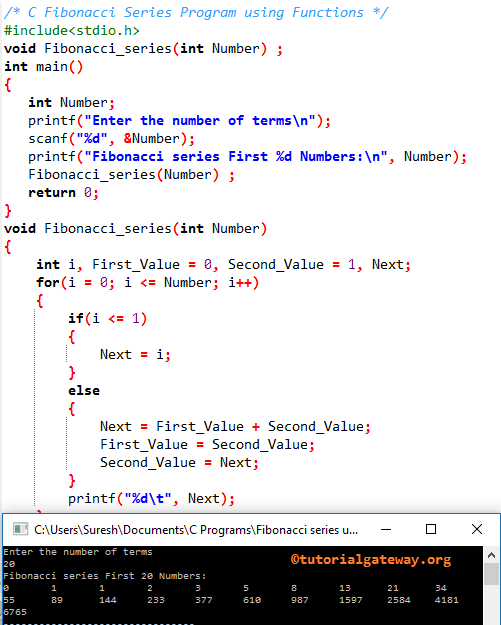 This C Program program allows the user to enter any positive integer, and display the Fibonacci series of number from 0 to user specified number using Recursion concept. if (Number == 0) will check, whether the given number is 0 or not. If it is TRUE, function will return the value Zero. if (Number == 1) will check, whether the specified number equal to 1 or not. If it is TRUE, function will return the value One. If the number is greater than 1, compiler will execute the statements inside the else block. 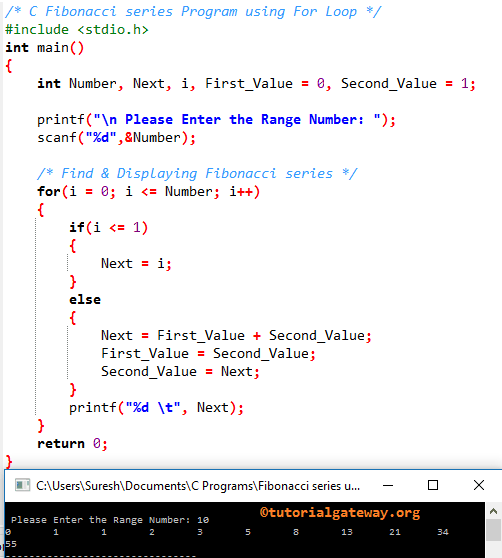 Within the Else block we are calling the Fibonacci_Series function recursively to display the Fibonacci numbers. NOTE: For Recursive functions it is very important to place a condition before using the function recursively otherwise, we will end up in infinite execution (Same like infinite Loop).